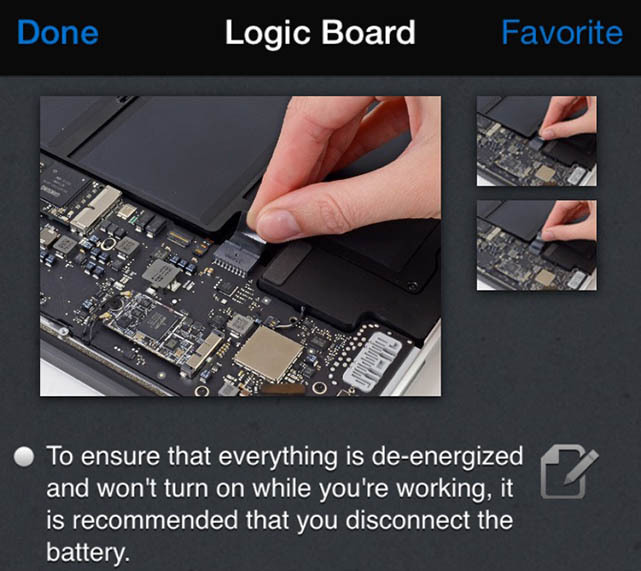 The iFixit app (free) is a handy little app that gives your Do-It-Yourself repairs a big boost. This app comes from the teardown experts at iFixit, who delight in exploring the inner secrets of your favorite tech (or not-so-techie) hardware. The iFixit app helps you repair just about anything from toilets to garage door openers, cameras, cars, and of course, PCs and Macs. iFixit is divided by categories, or you can search by type of repair or brand name. When you get to Mac, for example, there's a choice of desktops, laptops, or other Mac hardware. You work your way down the list for a specific model, and then the repair options appear. The app tells you what parts you may need and any tools required. Repair steps are in short sections that you swipe to go to the next step and the instructions are usually accompanied by photos. The app reaches out to the internet for much of the information it needs, otherwise iFixit would be an unwieldy and huge app. If you like to do repairs yourself, saving money and extending the life of what you own, the iFixit app is a must. In addition to repair instructions, you can often download a PDF product manual. Any repair can be marked as a favorite for future reference. If you need to order parts, the app tells you where they can be purchased. You can even order tools from iFixit if you don't have them on hand. iFixit works well, and covers thousands of brands and repairs. The app requires iOS 6.1 or later, and it is optimized for the iPhone 5. The app is universal. Free is always good, and iFixit is a really worthwhile app to have. iFixit gives you thousands of repair manuals in your pocket originally appeared on TUAW: Apple news, reviews and how-tos since 2004 on Mon, 26 Jan 2015 18:00:00 EST. iFixit gives you thousands of repair manuals in your pocket originally appeared on TUAW: Apple news, reviews and how-tos since 2004 on Mon, 26 Jan 2015 18:00:00 EST. Please see our terms for use of feeds.